Our children pray a certain way because they’ve seen the way we pray. Indeed, imitation is a crucial part of child development. What children see around them, they often mirror. We have the incredibly important job of instilling culture into our kids. When we hear the word culture, we often think of the values and customs of a certain country, city, or even a church; but culture is always formed at home. In the United States, our children do not learn English from the school system, but rather develop it further. Children do not go to school to learn English; they go to school with English. They’ve spent their entire lives in a home where English is consistently spoken, and they pick it up easily from being around it so much. In the same way, we want to have children who come to their church, school, and city, already living a supernatural lifestyle. In fact, whether or not culture is expressed through the children is the way to truly recognize a culture. Asking God questions out loud throughout the day whenever and wherever! The desire is that our children can observe our relationship with God and how this relationship works in real life. Of course, we can make a point to ask these questions in a way that doesn’t seem like we’re talking to ourselves or over-spiritualizing our lives. We also can lead our children to ask God questions too! When they don't know something or need direction in an area, you can encourage them to talk to God about it. For example, when we watch movies we can look for moments that could start a conversation about God. I believe that God gave us this story (Him sending His son to die for our sins. ), and many others, to help us understand Jesus clearer. By sharing these beliefs with our kids, we are teaching them that God is speaking to us all the time. By doing this we are letting them see the way their own dad and mom listen to hear God’s voice and we are teaching them to do the same. 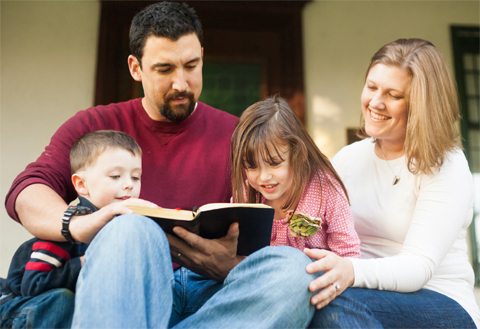 When we read the Bible at home, Sometimes our children often want to read the same stories over and over. When children are drawn to a Bible story like this, it’s likely that they're attracted to the characters in the story because they share a similar calling or characteristics. We can take these opportunities to encourage our children and to speak destiny over them. For example, your child might love the story of Moses. When you finish reading the story, you can tell them they are a great leader like Moses and that, like Moses, God is going to use them to help many people, set them free, and lead them. Also you can share revelations that God has given you personally about the stories you read, not just what the children's Bibles say. As you can see, these are simple ways that we make God a part of our daily life and conversation with our kids. Our hope is that the norm of having God involved in all aspects of life creates a culture in their hearts. As Parents and care takers of our children, we try to protect our family physically, from things that might harm them. Being the leaders of your family you must be the first into "battle", you must be the one who knows that “Greater love has no one than this, that someone lay down his life for his friends” (John 15:13). But there is more to it than simply being the first down the stairs when there is a noise in the night. You must also be proactive, protecting your family from predators. You must be constantly aware, constantly on guard against danger your family may encounter. Reading in Luke 11:14-23, something interesting stood out to me. This story is about Jesus and how He cast out a spirit from a man. Some of the people who were there, Said that it was only by the power of Beelzebub ( The prince of demons) that Jesus was able to cast out demons. They did not Believe that Jesus was God's Son. Jesus Responds, " Any kingdom divided against itself will be ruined, and a house divided against itself will fall." Did you catch that last part? A house divided against itself will fall... The enemy knows this, and he will do anything to try bring your family apart. This story reminded me of this verse in Ephesians it says, "Be strong in the Lord and in the power of His might. Put on the whole armor of God, that you may be able to stand against the attacks of the devil. For we do not wrestle against flesh and blood, but against principalities, against powers, against the rulers of the darkness of this age, against spiritual hosts of wickedness in the heavenly places. Therefore take up the whole armor of God, that you may be able to withstand in the evil day, and having done all, to stand." To protect our families from falling apart as said in the end of verses 17, we should put on the armor of God every day. Let us continue reading in Luke 11:21-23 it says, "When a strong man, fully armed, guards his own palace, his goods are in peace. But when a stronger than he comes upon him and overcomes him, he takes from him all his armor in which he trusted, and divides his spoils." Once again Jesus is saying that we need to be armed (with the armor of God) to protect our Home, our families, and our marriages. We need to fight in prayer for our children, our marriages, and our own walk with God in prayer. The conclusion is let us put on the armor of God daily. This world and the enemy is always trying to pull us and our families away from God, so we need to fight. Remember that we do not fight alone, God promises to fight for us, and we have power with His Holy Spirit to defeat the devil.